An Ancient Solar System...: Water carved valleys on Ceres? Above Top: The latest image of Ceres. 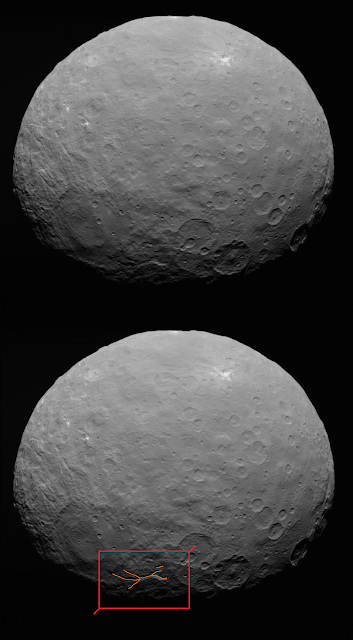 Above bottom: The latest image of Ceres with my highlighting of what I think might be one of the dendritic valleys. A number of pundits looking at the latest image releases from the Dawn mission to Ceres are claiming to be seeing dendritic valleys. Dendrite means that they valleys break into many fingers or channels at one end - a pattern that usually indicates a valley carved by a fluid flow, or even a fluid flow caused by precipitation (rain). As one amateur image buff exclaimed "are we looking at Ceres or Mars?" Could it have once rained on Ceres? Well, ok, anything's possible*, but right now Ceres has no atmosphere at all, so I'd say rain is unlikely. However the idea that we might find signs of water flow on Ceres isn't so crazy - even though the surface is far less hospitable than Mars, where signs of water floes have been debated for decades. The reason why I say this is because, to the great surprise of many, possible signs of water (or at least water-y sludge) flow were seen on Vesta by Dawn. If it could happen on Vesta then it could happen on Ceres - but there's no official word yet, only Internet scuttlebutt, and a proper analysis of the possibilities for Cerean water will take years. And that's after many more, much higher resolution, images have been taken by Dawn, so don't hold your breath for a quick and definite answer. 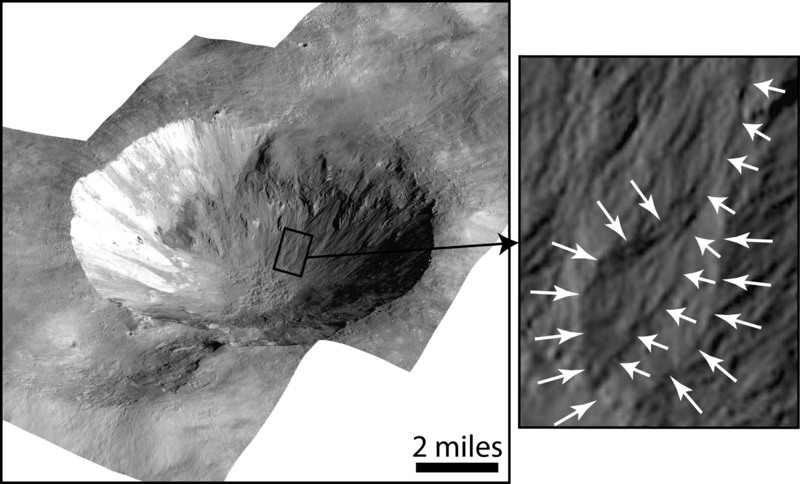 Above: Possible water carved features on Vesta. Courtesy of NASA. Earth's biosphere affected by galactic orbit? It's kind of a recurring theme in space research: Does the path of our solar system through The Milky Way galaxy have any influence on the timing of asteroid/comet strikes, drops in the Suns brightness, and other things that could cause mass extinctions? Impending cosmic doom is a great motivator, and I've read papers arguing one way or the other before, but this is the first time I've read an entire thesis on the subject. The answer it arrives at isn't entirely yes or no, but it definitely rules out a lot of possibilities, based on the data we currently have to hand.